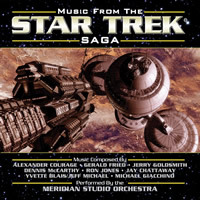 BSX Records presents MUSIC FROM THE STAR TREK SAGA, a brand new collection of freshly recorded and arranged performances by the Meridian Studio Orchestra from various corners of the STAR TREK universe. This 18-track collection brings together music from every generation of Star Trek, covering all TV series, a selection of the movies and - of interest to many fans - STAR TREK: THE ANIMATED SERIES along with other rare gems. MUSIC FROM THE STAR TREK SAGA includes music composed by Alexander Courage, Gerald Fried, Jerry Goldsmith, Dennis McCarthy, Ron Jones, Jay Chattaway, Yvette Blais & Jeff Michael and Michael Giacchino. MUSIC FROM THE STAR TREK SAGA features music performed by an array of talented performers, including Original Series composer Gerald Fried who contributes a memorable medley of classic TOS music. The inclusion of the Animated Series theme is bound to please a multitude of fans who have been hoping to get the music from the short lived TOS spinoff for a very long time. MUSIC FROM THE STAR TREK SAGA includes liner notes from author Randall Larson providing important details about the album selections, the composers and the featured performers. MUSIC FROM THE STAR TREK SAGA features music from STAR TREK: THE ORIGINAL SERIES, STAR TREK: THE ANIMATED SERIES, STAR TREK: THE NEXT GENERATION, STAR TREK: DEEP SPACE NINE, STAR TREK: VOYAGER, STAR TREK: ENTERPRISE, STAR TREK: THE MOTION PICTURES and the 2009 feature film version of STAR TREK.